The Bower 0.38x Super Wide Angle Lens is an ultra-wide angle lens that attaches to the front of your existing lens with a 37mm filter thread. Using this "auxiliary" wide angle lens is an affordable way to expand the capabilities of your current lens and is particularly useful for unusual closeups and panoramic landscapes. Box Dimensions (LxWxH) 3.1 x 3.1 x 3.0"
VLB3837 0.38x Super Wide Angle Lens (37mm Thread, Black) is rated 4.0 out of 5 by 2. Rated 3 out of 5 by Pastor Calix from Everything I spect it in my purchase. simple, screw on unscrew for macro piece of cake fun, everything I spect it. 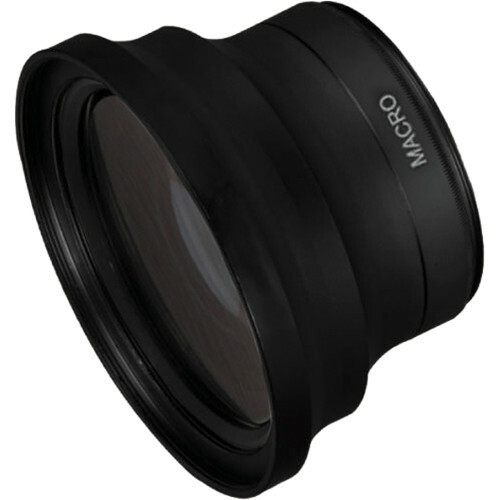 I wish it came with the lens hood or at least prescribe or offer what kind of hood will it fit the the wide angle lens hood size to fit this lens is 62mm, it give the camcorder a most profecional look, it will be best to buy then togheter. I give a 3 stars for lack of inf fron seller, but money well spend to me. Rated 5 out of 5 by notslow_joe from You get a lot for a small price! Very quick to add on. No adjustments necessary, just point and shoot.